Takes up very little space, well built. Quite expensive - should prove to be reliable though. 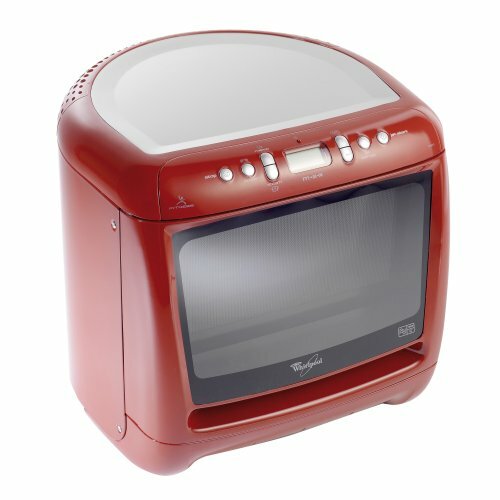 Looking to buy a compact solo microwave? The Whirlpool Max 25 range could be ideal for you - it's unique rounded back design means it takes up very little kitchen space, yet is still large enough to be practical, with a 28cm turntable. The curved back means it can be pushed deeper into a corner than a regular rectangular microwave - thus taking up a lot less room. Although only listed as a 13 litre model, it still provides the same amount of usable space as a 20 litre Whirlpool microwave, thanks to it's intelligent design. The placement of the controls at the top of the microwave helps to reduce the amount of work surface it takes up, with 7 different power levels, as well as a healthy steam option. The maximum power output is 750w, with the Whirlpool 3D distribution system providing uniform coverage, with no cold or uncooked spots during our test period. Overall we were impressed with the build quality of this red microwave oven - granted, it's not the cheapest out there - however it performs really well and is worth the extra few pounds. The Whirlpool Max 25 Red is very well built, and very compact - if space is of a premium in your kitchen, then it is well worth considering. Performs really well, cooks beautifully, and takes up very little room. Red Finish to the exterior. This microwave is also available in silver. 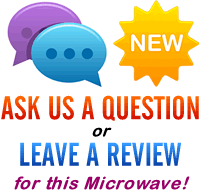 Hi Pam – both the max 25 and max 35 models have rounded backs, and flat fronts – you might want to double check with the retailer (we only review microwaves, not sell them) but it should feature a flat front and rounded back so that it will fit deeper into your kitchen corner.